Love turkey but only eat it around the holidays? Check out this 5 Ingredient Cranberry BBQ Turkey Recipe to enjoy all year long! I love turkey, honestly more so than chicken. But, I am also one of those people that only really eats turkey around the holidays other than the occasional turkey sandwich or turkey burger throughout the year. It’s something I’ve been wanting to change, though, so when I was looking through turkey products at the store, I was happy to see that Shady Brook Farms now has ground turkey, sausage, tenderloins, cutlets, burgers and more from turkeys raised without growth-promoting antibiotics. I find turkey to be a delicious lean substitution for some of our favorite grilled summer dishes traditionally made with beef or pork. I’m a fan of Shady Brook Farms because they work with more than 700 independent farmers that produce wholesome turkeys while being committed to offering better food at a better price. If you want to make sure the turkey you purchase for your family is raised without growth-promoting antibiotics from farmers who care, just look for the USDA Process Verified seal on the packaging. 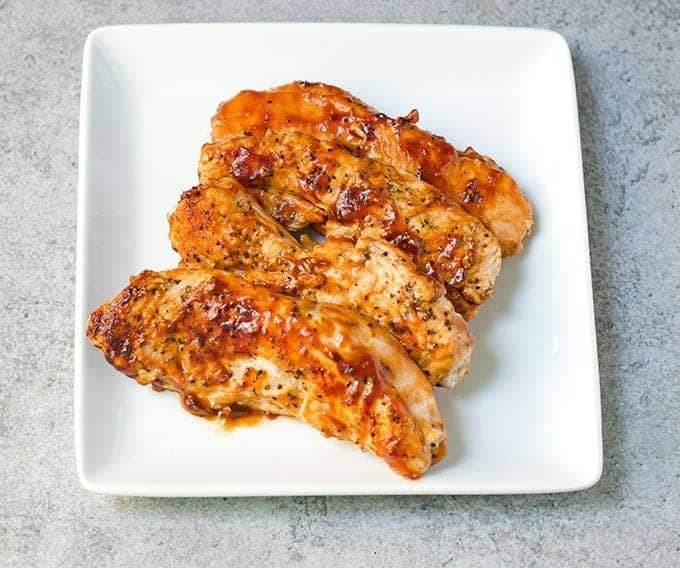 Shady Brook Farms asked me to make a tasty Memorial Day turkey recipe, so I couldn’t resist picking up some cutlets and came up with a super easy 5 ingredient cranberry BBQ turkey recipe. 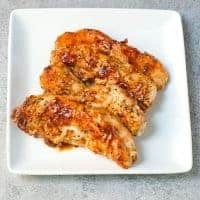 It’s such an easy BBQ recipe that takes minutes to prep and not long at all to cook since the cutlets are boneless. 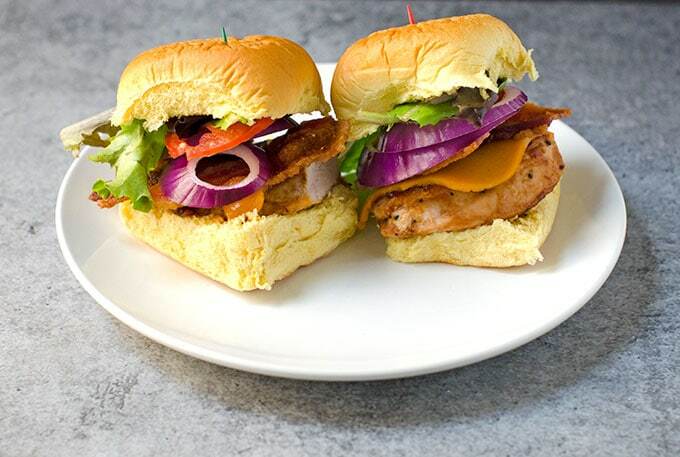 Next time I plan to grill up a bunch to eat throughout the week as they’re not only great paired with some grilled veggies for dinner but also to make sliders and as a salad topper. This cranberry BBQ turkey recipe can be made on your traditional outdoor grill, but is also great using a grill pan indoors on the stovetop. Pre-heat grill or grill pan to medium-high while preparing turkey to grill. Season turkey cutlets on both sides with salt and pepper. Prepare cranberry BBQ sauce by microwaving cranberry sauce in a small microwave-safe bowl (or cooking in a small pot or skillet) until melted. Once melted, stir in BBQ sauce, a pinch of salt and pepper and garlic, if desired, until well combined. When the grill is pre-heated, grill turkey cutlets (without BBQ sauce) for about 4 minutes on the first side. After 4 minutes, flip cutlets and brush on cranberry BBQ sauce on the top (grilled) side. Grill other side for 3 - 4 minutes. Flip cutlets again and brush top side with BBQ sauce. Flip cutlets as needed for even cooking, brushing more BBQ sauce as desired for another 1 - 2 minutes until turkey cutlets have an internal temperature of 165°F. Remove cutlets from grill to a plate, tent with foil and allow to rest 2 - 3 minutes before serving. Find out more about Shady Brook Farms by visiting the Shady Brook Farms Facebook page. Will you be making this 5 Ingredient Cranberry BBQ Turkey Recipe this summer?